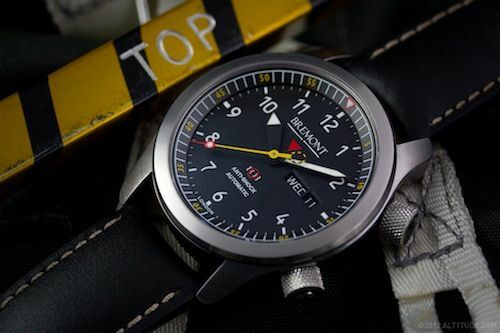 The Bremont MBII was designed by Nick and Giles English, the brands founders, to be the “definitive aviation chronometer” and to embody everything that is meant by the phrase “made in Britain.” This limited edition piece created in conjunction with British retailer The Watch Gallery in London was to take that a step further and create a totally one off MBII that would be severely limited in numbers. With thanks to Alt1tude.com for the pictures. This unique collaboration has taken the best the MB (Martin Baker) range has to offer, as well as a few surprises, and rolled it in to one watch. The result? The MBII/TWG, limited to 30 pieces worldwide. The watch itself doesn’t look too dissimilar from the standard MBII watch, apart from the fact that the watch has the same yellow seconds hands and internal rotating bezel as the MBI, which you only become eligible to own if you have been (un)lucky enough to have ejected from an aircraft using a Martin Baker ejector seat. Arguably, the trademark of the MBII/TWG (and indeed all of the Bremont collection) is the Trip-Tick® case construction. This is unique to Bremont and means that the watch case is created of three pieces: the case back, the front of the case (including the crystal) and the central aluminium knurled and coloured barrel. The standard MBII line is available with three colours of barrel: green, orange and anthracite, and the MBI is available with only a red barrel. This limited edition MBII, however, has a midnight blue barrel (the signature colour of The Watch Gallery) which is complemented nicely by the aforementioned yellow accents on the dial. Where the watch really begins to shine though is when you turn the watch over, exposing the Bremont modified BE-36AE movement. This unique ‘open’ case back is only found on this edition of the watch and really makes it stand out from the other watches offered in the “Martin Baker” collection. The movement itself is nicely decorated and has a gold coloured skeletised (brass?) “Bremont” decorated rotor, along with Guilloché wave patterns adorning the rest of the movement. Along with these fine details, the addition of blued jewels by the Bremont watch makers is a lovely touch and really makes the movement pleasing to the eye. 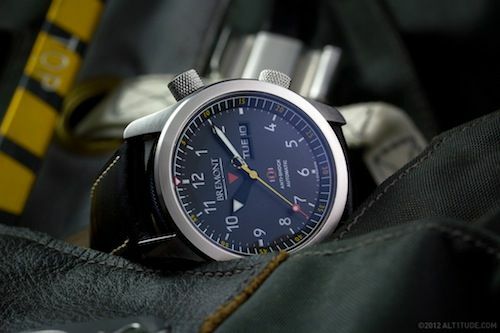 Overall, The Watch Gallery limited edition Bremont MBII is a fine watch, and in my opinion, Nick and Giles certainly created something that is certainly worthy of the title the “definitive aviation chronometer.” I, for one, will be buying another Bremont soon, and I think you should too!